Books, magazines, and even blogs about CAD Management oftentimes scare me. They scare me in the message they broadcast, even if not intentional, that after reading such and such title I can create a CAD Standard in 30 days and be a world-renowned CAD Manager. While the timeframe may be a bit of an exaggeration, the fact readers oftentimes go away with false hope is not. As anyone who has worn the hat of a CAD Manager if only for a day knows, CAD Management and Standardization is not an overnight process. Under that premise I have come to respect a number of authors who are especially diligent in what they write as not to convey a false message. At the top of that list is Robert Green who is arguably the most well known and well respected individuals in the CAD Management industry. Robert’s notoriety comes with good reason, as he is one of the most versed individuals in nearly every industry that uses CAD. 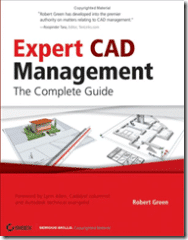 His packs a large portion of that knowledge into his latest book “Expert CAD Management: The Complete Guide“. First and foremost, Robert’s book is not a step-by-step guide about how to configure AutoCAD. If you’re looking for things like sample AutoCAD Layer Worksheets, then this is not the book for you. Instead Robert’s book focuses more on concept, and other non technical challenges of a CAD Manager. A large part to being a CAD Manager is being a bit of a middleman. You have to effectively communicate with both users and upper management. Justifying costs and showing return on investment for CAD related purchases, helping users solve technical issues, each integral roles of a CAD Manager. Understandably Robert’s book is not aimed at AutoCAD users, but instead the specific group of individuals who wear the hat of CAD Manager. Just from participating in my local AutoCAD user group I have seen how the challenges of a 20 person firm are much the same as those I experience in my firm of 350. Typically speaking, the size of the firm seems to make very little difference as to the difficulty of addressing certain issues. Upper management is always especially concerned about the bottom line; CAD Users need to stay ahead of the curve to remain competitive, just to name a few. Again, this is not a book for CAD users, but rather CAD Managers. The book starts with big topics such as training users, managing standards, even managing managers, and breaks each one down into manageable sub-topics. While some of the smaller topics seem elementary at times, Robert does a great job at tying each piece together to paint a single comprehensive picture of CAD Management. With so much of a CAD Managers role revolving around interpersonal skills, it’s not an easy topic to communicate. Robert does a great job, breaking it down enough for new CAD managers, but also providing enough depth for veteran CAD Managers.